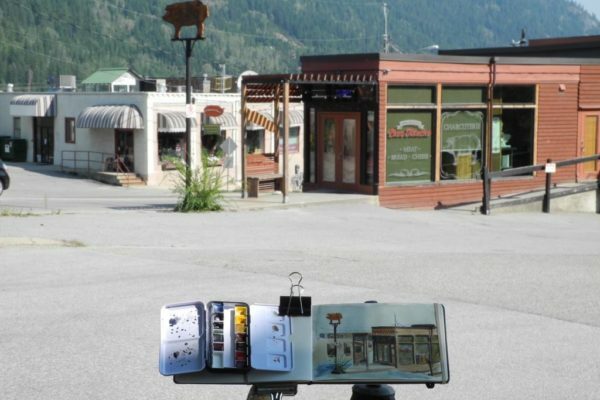 Last month, I decided to challenge myself and enter the “paint a storefront” challenge organized by one of my favourite artists James Gurney. 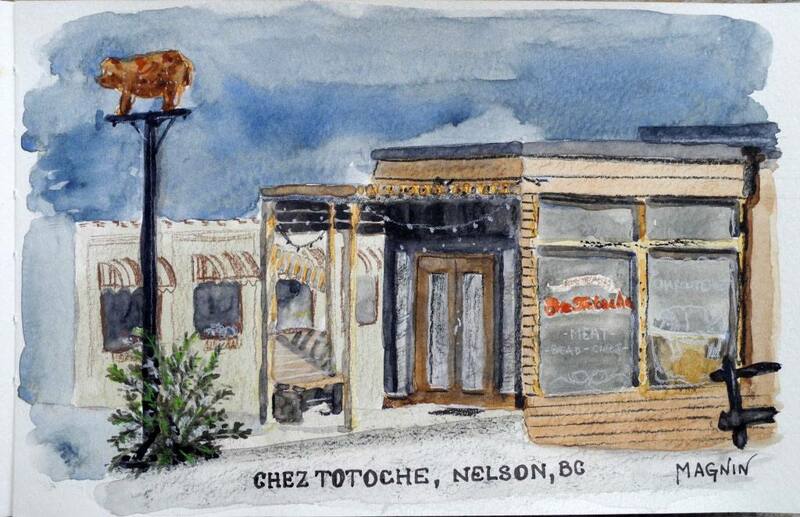 So I went to my favourite French deli in town (Nelson, BC) Chez Totoche and sketched the storefront. 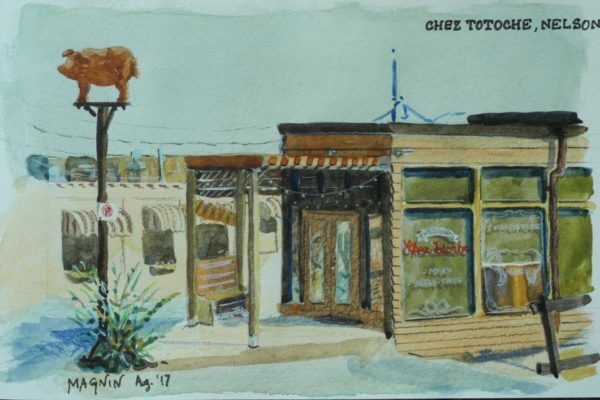 I took about an hour to do the drawing and measurements right, and another two hours to paint it with watercolours and watercolour pencils (for fine details at the end) in my Moleskine watercolour sketchbook (5″x8.25″). A local artist saw me, came to chat and made a couple of suggestions to improve my values and colours which was very nice. By the end of it, I was very proud of myself and quite pleased with the result. But looking at it the next day and the day after that, I started to see the mistakes and I got many ideas of improvements. So I went back a week later and did it again. I have done that several times with other sketches and I find it is a great way for me to improve my work. I took the same amount of time for this second sketch but I felt more confident and like I had more time for details. The result was significantly better than the first (you can see an image of the first sketch below as well as a photo of the building). 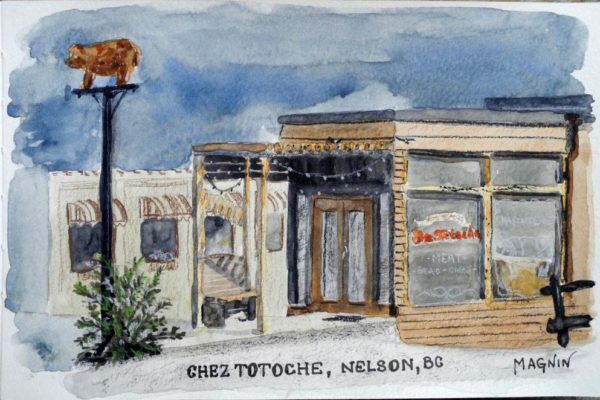 A simple sketch like this one takes a lot of concentration and doing it on location is so much more difficult than in a studio with the light changing, the noise of traffic and people around, sun, rain, wind, etc. James Gurney posted the winners last Sunday. There were some incredible paintings posted for this challenge and the winners really deserved their rewards. Congratulations to them! 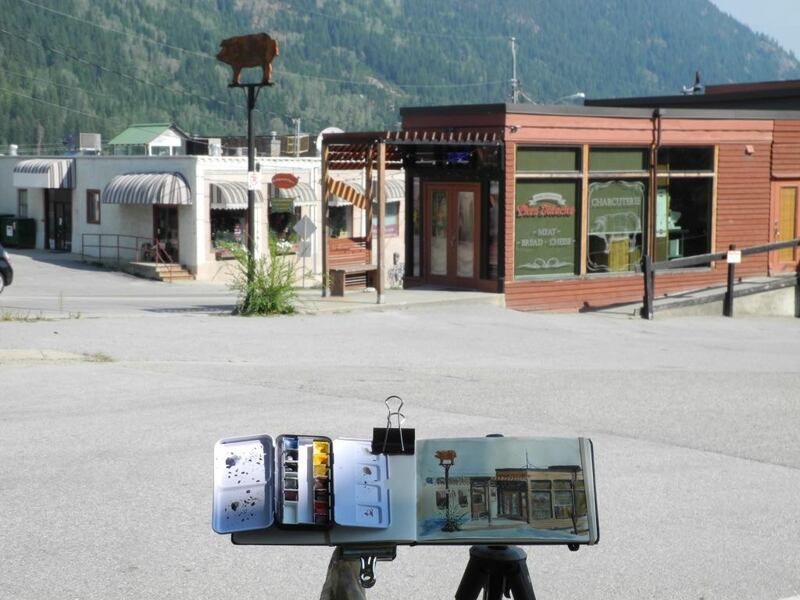 All in all, it was a fantastic experience, a great motivation and inspiration to go out and paint on location. The camaraderie on the Facebook page was really appreciated too with artists commenting on each other’s work. Not as good as being all in person together but the next best thing I guess! 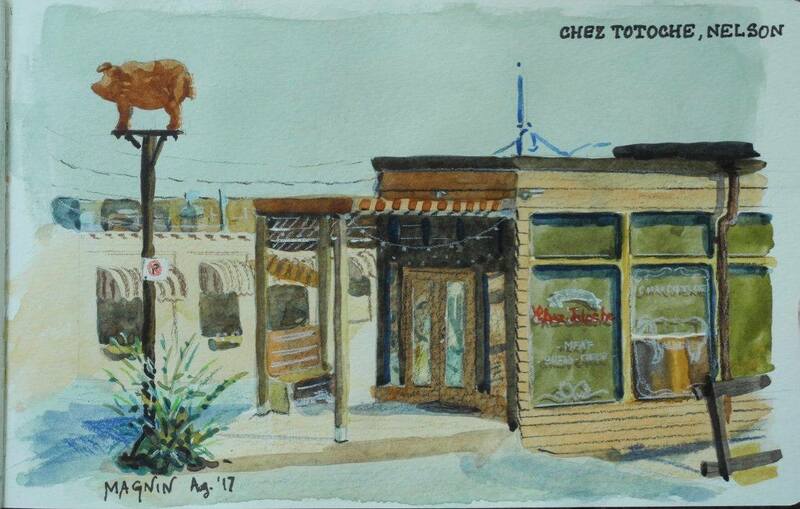 Today, I took the sketch to the owners of Chez Totoche (Claire & Guillaume): they were very happy and posted it on their own Facebook page.